KNET Service One Time Password OTP | Cards | Al Ahli Bank of Kuwait K.S.C.P. KNET is adding a new security layer for any online transaction made via KNET’s payment gateway. 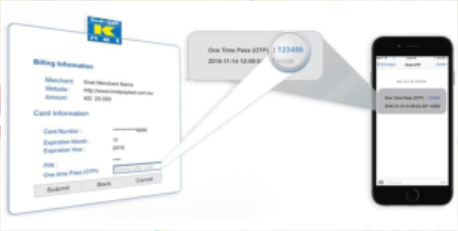 The newly introduced security layer is a 2 Factor Authentication method called One-Time Password (OTP). Any online transaction using KNET’s payment gateway below KD 25 will only require Pin authentication. The OTP code is 6 digit code for one transaction and valid for 4 minutes. In case the OTP expires you need to make a new payment transaction and authenticate it with a new OTP. The OTP is only for KNET’s online payment gateway and not for POS. Ensure to update your mobile number by visiting the nearest ABK branch. *International numbers cannot be registered for OTP, only local Kuwait mobile providers.